WATCH Who is Ryan Zinke? The Interior Department's internal watchdog has opened a preliminary review into reports that Interior Sec. Ryan Zinke was involved in a real estate deal in his hometown and met with a Halliburton executive about that deal in his office in Washington. The investigation was requested by House Democrats on committees with oversight of Interior who say that Zinke's conversation with the executive and developers on the project could violate ethics rule about using his office for personal gain. 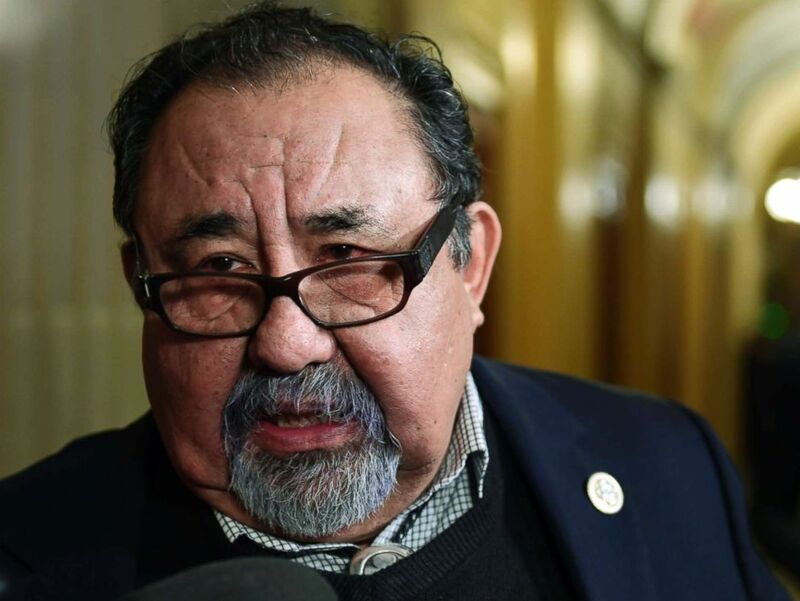 Rep. Raul Grijalva, the ranking member of the House Natural Resources Committee, said in a letter to the inspector general that Zinke met with Halliburton CEO David Lesar and a developer for the project in his office at Interior, raising questions about whether Zinke was still involved in a foundation that the department said he recused himself from. Grijalva's letter, also signed by Rep. Donald McEachin, D, Va., and Rep. Jared Huffman, D-Ca., cited a Politico report that first reported the real estate deal. A spokeswoman for the Interior inspector general's office Nancy DiPaolo said they opened a formal complaint on June 20 and that a preliminary review is underway. Rep. Raul Grijalva speaks with reporters on Capitol Hill in Washington, Jan. 17, 2018. Zinke confirmed that he met with Halliburton Chairman David Lesar and his son about the background of the project in an interview this week. "We go out to dinner. We talk about the background of the park. What are the neighbors like, what was the vision of the park, where the boundaries are, where the water table is because the water table has changed over time, what the railroad is. You know, so they have the background," Zinke said in an interview on Voices of Montana radio show. "And clearly, I'm not on the board anymore. My wife runs the board. And they make a letter of intent for my wife that you know what, the community is for this project, the city approves it. It's a good project for Whitefish. We'll share some parking lots with you. That's it." The Democrats say that Zinke met with Halliburton chairman and CEO David Lesar and a developer for the project in his office at the Interior Department last August, even though Zinke is recused from the foundation that is involved in the project. Zinke founded the Great Northern Veterans Peace Park Foundation in 2008 to create a park in his hometown Whitefish, Montana. Plans shared with Zinke show the property would include sled runs, retail space, and a microbrewery. Zinke's spokeswoman provided documents to ABC News showing that Zinke resigned his position at the foundation in March, but the Democrats say that meeting with people involved with the development five months later raises questions about whether Zinke was really recused from the foundation's work and whether he used his office at Interior for personal gain. "Though he has claimed that he is no longer involved with the foundation, he continues to be involved with the fate of the foundation's land, which was initially donated more than a decade ago to be a Veterans Peace Park," Grijalva wrote in the letter. Zinke's wife, Lola, is still listed as an officer of the foundation in public records and their daughter is the treasurer. The nonprofit watchdog group Public Citizen wrote to Interior's ethics office this week calling for them to investigate whether Zinke's or his family's business relationship with Halliburton violated federal ethics rules. A spokeswoman for Halliburton said the meeting was not related to the company and that Lesar's investment in the deal is personal. "The Company is confident that any actions of the Interior Department will not be influenced by Mr. Lesar’s personal investment," spokeswoman Emily Mir told ABC News in a statement. Internal agency emails released by Interior Department show that Zinke had a scheduled meeting with David Lesar, the chairman of Halliburton, John Lesar, and Casey Malmquist on August 3 of last year. On a version of his calendar that was also released the same time frame that day was marked only as "HOLD." Zinke's spokeswoman Heather Swift said the meeting was on Zinke's personal time and that the three men talked to the secretary about the history and previous work on the project. "The two gentlemen talked on the Secretary’s personal time about the history of the site, previous studies, promised access and uses of the park, and the work that had gone into the park up to the point of the Secretary’s resignation. The Secretary adheres to all applicable laws, rules and regulations. He goes above and beyond mere technical compliance and strives for full transparency," Swift said in a statement. The meeting was scheduled from 4:30pm to 6pm on August 3 of last year, according to documents publicly released by Interior. The Democrats cite an email from the developer for the project to Zinke after that meeting as evidence Zinke might still be involved in the project. The developer emailed Zinke's personal email account on August 13 calling the project a "grand slam" and saying they are "honored" to be associated with the secretary. "I know you are extremely engaged and consumer with your role as Interior Secretary. I want you to know that whatever assistance you need to protect and promote your vision for the park, please let me know and I will make sure it is communicated and executed," Malmquist wrote in the August 13 email. The email was included in emails publicly released by the Interior Department because it was forwarded from Zinke's personal account to his department account. Swift said the developer emailed Zinke's personal email to get background info on the park project that no one else had. She also said Zinke forwarded Malmquist's email from his personal account out of an abundance of caution and to be transparent. ABC News Soorin Kim contributed to this report.